HQ Trivia is the hottest game on mobile since Pokemon Go! Everyone is playing. It’s been featured on too many daytime talk shows, late night hipsters shows and social media vlogs to mention. If you’ve never played, you should download and install it immediately. HQ Trivia is a live trivia game show right on your mobile device. Games happen twice a day on weekdays and Saturday and Sunday nights. Think Who Wants To Be A Millionaire on your phone. You compete live, against 100s of thousands (sometimes millions) of other players. There are 12 multiple choice trivia questions. Just tap the button with the right answers in the 10 second window to move on to the next round. If you answers all 12 questions correctly, you win the daily prize (or share it with the other winners). Daily prizes are typically $2500, but have been as high as $20,000 on special nights, like Super Bowl Sunday. Just like Who Wants To Be A Millionaire, the questions start easy (very easy – sometimes so easy you think it’s a trick question, but it’s not) and get progressively harder with each round. There have even been games with no winners (the prize money gets added to the pot for the next game if this happens), but other times there are as many at 10,000 winners with the take home pay being far less than $1.00. So in a game that has a real cash prize, there is obviously stiff competition. That’s where HQ Trivia Answers comes into play. If you’re going to win on a regular basis (or even just once!) you may need some help. 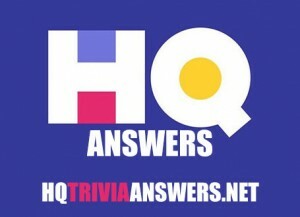 HQ Trivia Answers posts the answers to every question from every game. All you have to do is visit the site and check the list of games and times to view all the questions and answers.